Justice Wins ALWAYS! | Spaceship! Spaceship! Spaceship! 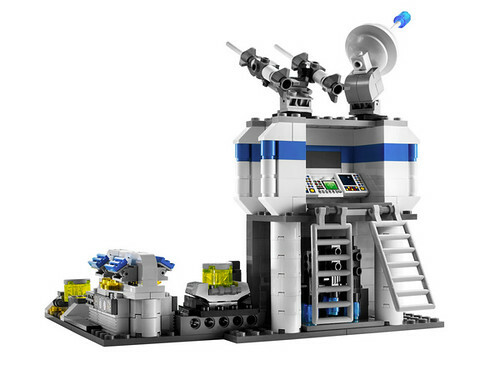 A while back I blogged the excellent Lunar Exploration Geological Outpost by Billyburg and noted the similarity to another great set: 10191 Star Justice, a LEGO Factory set from 2008 which was designed by LEGO fan Chris Giddens. You got a couple of neat little spaceships, a truck/rover thing that hinged in the middle, a little base built on some rocks and a ton of figs, robots and really useful parts. It has a lot of significance for me, as it was the set that snapped me out of my Dark Age and got me into LEGO again. Fuelled by nostalgia I looked it up online and realised I didn’t really know much about it or how it came to be AFOL designed before cuusoo/ideas, so I reached out to Chris and spoke to him briefly about it. Chris told me back in the early 2000’s the LEGO fan community was much smaller and the LEGO group was only just waking up to the potential of adult fans. Top management began to attend AFOL conventions like BrickFest, developed the idea of a line of FACTORY sets and approached AFOLs like Chris to design them. As Chris says “Through talking, being friendly, and building decently…. we got in”. The set had its roots in Classic Space. The truck with its 8 hinged wheels was a throwback to 6950 Mobile Rocket Transport and the base was open at the back like the classic bases of the 80s and 90s. The Star Justice theme gave it a clear goodies-v-baddies playability (there was a companion set, 10192 Space Skulls for the baddies, designed by Mark Sandlin); and Star Justice had these 2×2 trans neon yellow “round brick power/battery/container thingies” they had to stop Space Skulls from stealing. I had two of these sets and I swear I am still using the robot arms and headlight bricks! Chris told me they deliberately included useful parts “We wanted it to be fun to build, then when you wanted, you had great parts to rebuild with.” But it seems the limitation of parts imposed some drastic last-minute changes “My set actually had 3 spaceships and no base, but parts got dropped and I had to quickly redesign it”. 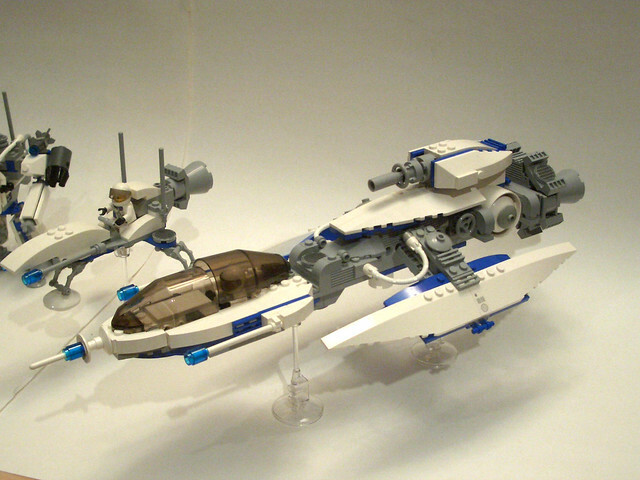 Check out Chris’ Flickr album for some of his work-in-progress designs. The Star Justice logo was also designed by Mark Sandlin and combined a LEGO Western Sherriff’s badge and the Classic Space swoosh. “It was fun bringing that back to a set… first time it had been done in a long time.” It was details like that which piqued my dormant interest in LEGO and eventually dragged me out of my dark age. Whilst it was never very popular (it was really overpriced; I only bought two because they were half price) it paved the way for the resurgence of interest in Classic Space which continues today. Chris closes “Knowing this set brought joy to a good number of fans makes me glad” and I can assure him it brought a lot of happiness to me! This entry was tagged classic space, ideas, swooshable. Bookmark the permalink.